When I was about 10, individual servings of pudding hit the big time. And by big time, I mean my lunch. Even then, I was quite discriminating in my pudding tastes. No low-brow Jell-O or no-name brands for me. I insisted on Laura Secord chocolate or butterscotch puddings. But one day, it hit me. I could make my own pudding. 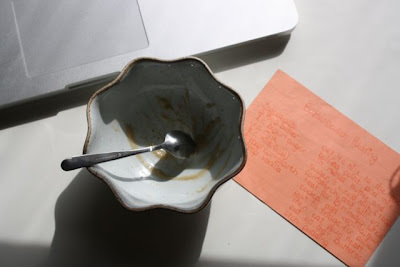 I just came across this old recipe card and thought I should try it again. 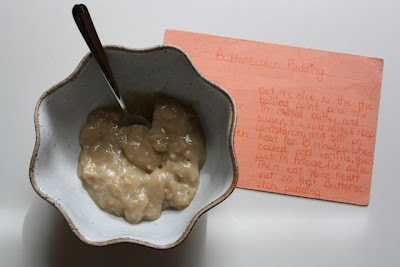 I mean, how could I resist a recipe where I wrote at the end, “Then eat your heart out on that butterscotch pudding”? I made it and I did eat my heart out. This pudding tastes homemade, without even a hint of processed butterscotch flavour. Brown sugar and butter make the butterscotch and that’s really all you need. I did add some Frangelico because I love the little hazelnut monk. I bet you could add any nice liqueur you’d like, or just more vanilla. Then eat your heart out on that butterscotch pudding. In a heavy-bottomed pot, heat 2 cups of milk over medium-low heat. While it’s heating, mix the cornstarch and 1/4 cup of milk in a separate bowl till it’s smooth. Once the hot milk has just started boiling, whisk in the butter, brown sugar, salt and milk-cornstarch mixture. Keep whisking until it’s fully incorporated. Stirring often, bring to a low boil for 10 minutes. Refrigerate until it has thickened – about 3 hours. That is an awesome story about pudding! I wish i could find my old recipe card from school, but sadly i have no clue where they are! I think this is a really awesome website. keep up the good work! I meant to tell you that I tried this awhile ago for night snack, with unsweetened vanilla almond milk and it turned out well! My guess is regular milk likely would taste better but us dairy free girls take our pudding however we can get it! I also didn't wait three hours - who can wait that long for yummy pudding?? An hour and a half and it was good. I am sensing a strong need to re-establish the Picnic Club-- I am feeling that my early years of membership were somehow robbed of an entire blog's worth of great recipes. . . however, I do recall some good eats that haven't made the "must post" cut. **I am also a little concerned with the editor's decision to allow the word "meat" to remain in the second paragraph. I feel slightly impelled to question the authenticity of this entry. . .
oh, I love pudding and I've never tried making it...okay, now is the time!